For various reasons I've not done any fishing since I got back from Tobago so I thought a spot of news from my pal Alan in New Zealand might keep the pot boiling. I trust this note finds you and Lilian in the best of health and positively glowing against the UK snow with your Tobago tans. We arrived back from Turangi on Saturday 31 January and spent most of the weekend unpacking and cleaning up. I thought that I’d better send you the promised note summarising our summer holiday in Turangi before the details became too hazy. The settlement Turangi is located on the banks of the Tongariro river. The Tongariro river flows into the southern end of Lake Taupo and is recognised as one of the premium rainbow trout fisheries globally. 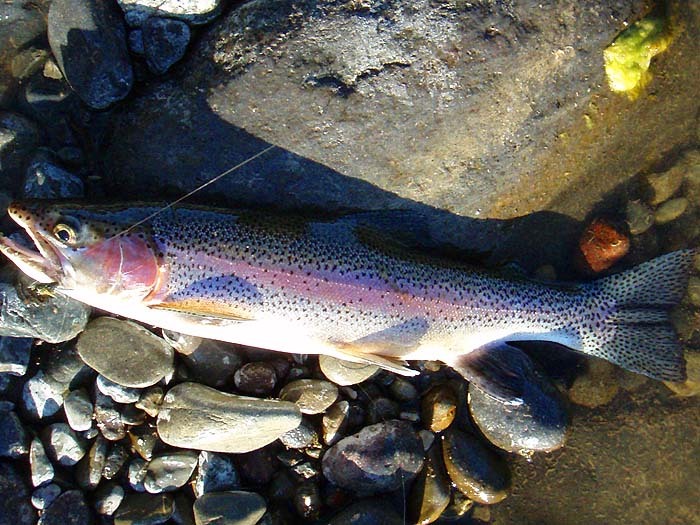 Most anglers fish for trout entering the many rivers that flow into Lake Taupo to spawn in the winter – spring period (June – November) and there is significantly less angling pressure over the summer months. 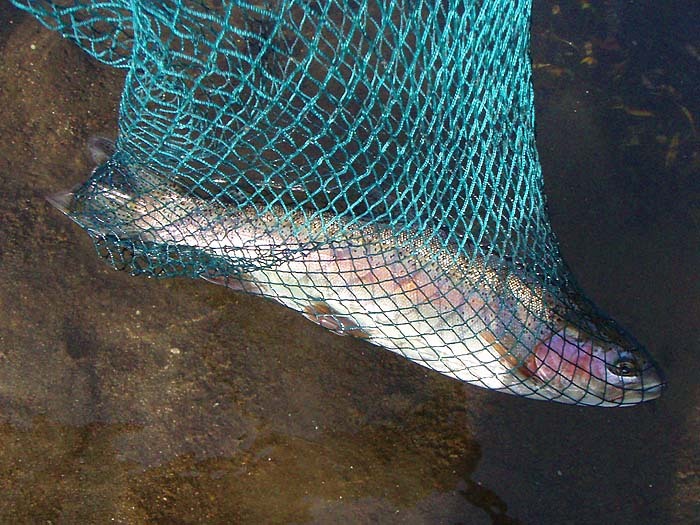 The Tongariro and Tauranga-Taupo rivers still contain large numbers of fish over the summer. Interspersed with the quality fish are kelts which are ravenous and feeding voraciously as they try to regain condition on their way back to the sanctuary of the lake. Many anglers do not like catching recovering kelts as they tend to fight poorly. Consequently they choose to target the lake and not the rivers. There is a huge amount of fly life around the rivers and lake during summer and the resident trout take full toll on the abundant cicadas and huhu beetles, in particular. It is not uncommon to see up to 25 cicadas on each pine tree near the river and we collected at least 10 huhu beetles per night on the deck outside our bach for the duration of our stay (see photographs). The cacophony from the chirruping cicadas is deafening and they fly from the trees in a blanket when disturbed by passing anglers. 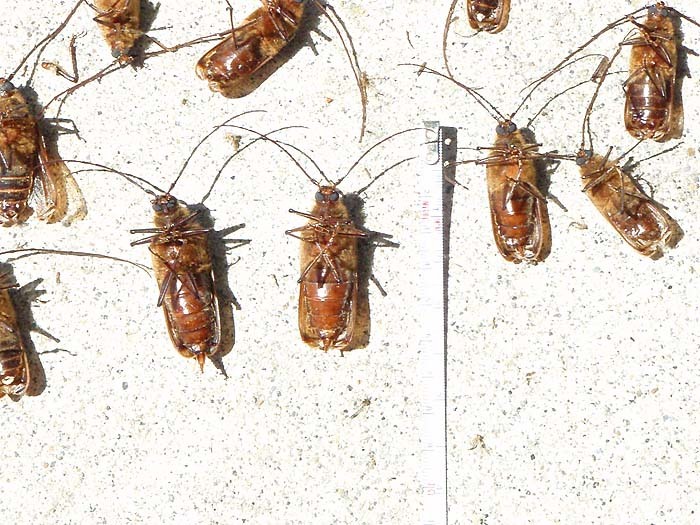 Both the cicadas and huhu beetles are large insects which are relatively poor fliers. 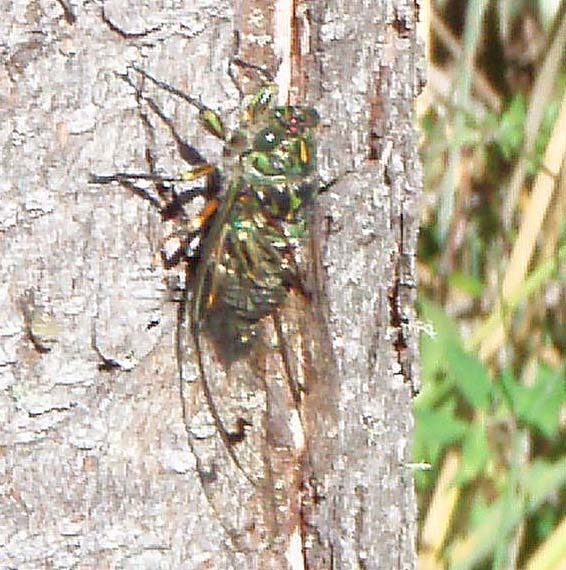 Taupo cicadas are generally more than 2 inches long and the huhu beetles can reach 3 – 4 inches in length. Half-a-dozen represent a veritable “power snack” and the fish rapidly gain weight when they lock into feeding on those insects unfortunate enough to be blown onto the water by passing wind gusts. The huhu beetles are very poor fliers and sound like muffled Iroquois helicopters. This can be very disconcerting as you hear the whirr of the wings intensify immediately before they hit you on the back of the head in the darkness. It took about 4 – 5 days of experimenting to discover where the fish were concentrated and which fly patterns were effective. I caught a number of kelts in the Tongariro and Tauranga-Taupo rivers before realising that they tended to be holding in the slacker water and switched to focus my attention to the swifter, deeper sections at the heads of the pools where the better quality fish were laying. There were good numbers of fish in the Upper Tongariro and some were truly enormous. Sandy and I watched 3 behemoths move around the Admirals Pool one day and they would have all been in excess of 15 lbs. They all were at least 6” across the shoulders. Unfortunately there was a queue of anglers waiting to try their luck and the water pressure was too great for me to wade out to get a shot at them. I’ll be back once the knee strengthens! The weather was stunning for the duration of our stay and was entirely predictable, hot (25 degrees C) cloudless days with clear blue skies. The mornings were inevitably calm until around 10 am when the breeze started to develop. The breeze continued to intensify in strength throughout the day, peaking at 4 – 6 pm before dropping back to nothing between 10 pm and midnight. I chose to fish in the early morning (7 – 9.30 am) as this avoided most of the heat and gave me the days free to play around in the lake with Sandy and the boys. The down side of fishing the more intimate Tauranga-Taupo is the large amount of detritus (mainly flood deposited Manuka saplings) present and the banks festooned with bramble. The bramble tendrils drop enticingly in the river and seem to have competitions to see how many flies they can collect, especially when the flies pass within touching distance (see the photograph entitled “Sandy amongst the snags” for a better idea). 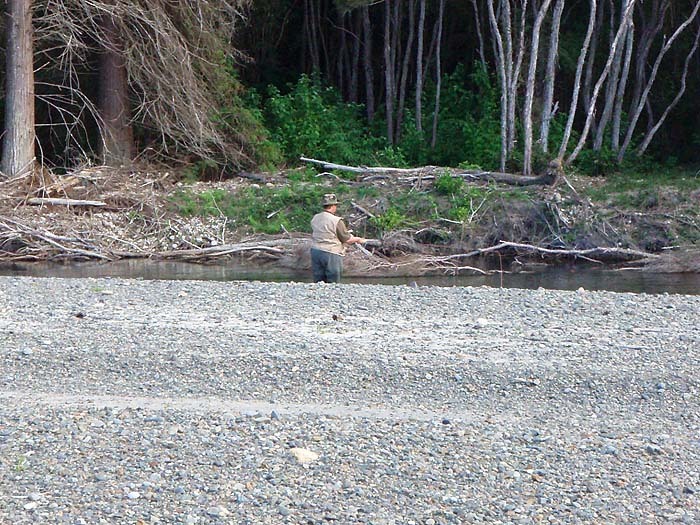 The trout tended to hug the banks and hold in the deeper water. When hooked they either took to the air immediately or switched on the after burners and headed for the nearest clump of underwater woodwork. This made life interesting as it was a white knuckle, no holds barred exercise to hold them out of the snags and many fish were lost due to hooks pulling out after 3-4 minutes of concerted head shaking struggle. Sandy and I were fishing with a large floating cicada fly and a small size 16 Pheasant tail nymph dropper. The fish (mostly in the range 3 – 5 lb) would appear from nowhere and travel up to 20 feet in the gin clear water to nail the floating fly in a huge swirl and flurry of spray. Heart stopping stuff! I missed heaps until I got the hang of it but still did not hook up on every fish that swirled at the Cicada fly. The bigger fish certainly were locked in on the floating Cicada whereas the smaller trout (including fingerlings) tended to nail the Pheasant tail nymph. None of the takes were subtle. Sandy was particularly adept at hooking up on fingerlings and I suspect this is because she tended to fish across and down whereas I tended to fish more upstream and followed the line down to get dead drift. Both of us caught a fingerling double which was a first. All in all (including long range releases) we hooked around 25 fish in the 9 days after we’d got our eye in. My best session was four fish hooked and 1 landed in 1.5 hours. Given that there was a lot of walking involved in moving from pool to pool the actual fishing time was probably only 45 minutes. I did catch two quality fish in consecutive runs on another day and landed both. They joined us for dinner after a spell in the smoker. Delicious! I’ve included some photographs of the fish caught to give you an idea as to the quality of the resident fish. There is a bit of concern at the moment amongst the Taupo fishery managers that the 2008 year class of fish were slightly smaller than normal and our results bear this out. There was a particularly cooler summer 2 years ago and I suspect that this is a factor in the equation. We will definitely be going back to Turangi again later in 2009 to tackle some fresh run spawning fish as they are truly amazing fish to hook, especially in the larger Tongariro. Thanks Alan. Not bad eh! It's refreshing (to me) to hear that there's not much prejudice about which fish to catch or what sort of 'lures' to use. I could fancy dobbing a 10cm dry huhu fly for trout (I think I could use my spinning rod if they'd let me - I really would feel more comfortable with it). Some sort of polystyrene popper wrapper in brown sticky tape would probably do the business. M.L.